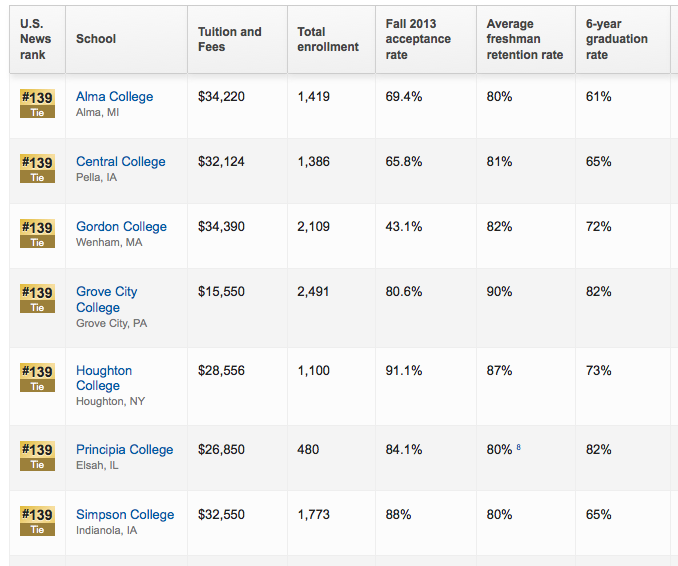 It appears that US News disagrees with Time.com’s Money section’s opinion about Principia College. While Time places Principia as the “best college” a B-average student can get into, USNews ranks it 139 and makes sure it ties with several other colleges for the privilege. US News’ ranking takes a number of factors into account, and while I’m not sure if they considered Principia’s exclusive Christian Science-only restrictions, I feel that 139th is a better representation of where Principia should be. Interestingly, US News takes into account alumni donations (conveniently locked behind the paywall so I can’t see it). I suppose if alumni like their school, they’ll donate more, which reflects well on the college. In this case, the alumnus in question has been pestered with so many mailings requesting “donations” that they’ve all ended up in the recycle bin. I am an alumnus of Principia College. I wish I could say that with pride. Academically, it has declined significantly from when I was there in the late 60s – early 70s. When the vast majority of alumni want nothing to do with their alma mater, that should tell the trustees something, but I guess they are stuck in denial. I do not cheer Principia’s decline, but it is clearly well on the way to mediocrity and irrelevance. A previous president of Principia, Stuart Jenkins, stated: “Principia needs to face the harsh reality that for the institution to survive it must make fundamental and dramatic changes.” Although Jenkins was a jerk with an inappropriate leadership style (and consequently was removed by the trustees), he was surely correct with that remark. The only way Principia College can thrive into the future is to become an outstanding educational institution first and foremost–albeit one that is allied with Christian Science. Other colleges founded on a religious tradition use this model without damage to their religious mission, so why can’t Principia? Yes, it will require major changes: opening enrollment to non-CS students; hiring top faculty whether or not they are Christian Scientists; teaching the sciences whole and unfiltered; encouraging academic freedom and critical scholarship. But such a change would open the campus to competing beliefs systems and would pose a challenge to Christian Science (a good thing). Sadly, I doubt the trustees are capable of saving Principia. I have to agree with “realscience”. I too am a not-so-proud alum of Principia, having attended in the late 1980s to early 1990s–20 years on from realscience. It’s sad to see the academic decline even since my time there. My last perusal of the Prin catalogue shows few faculty remaining from my time there, and far too many of the ones there now lacking PhD degrees. I also noted that many more are also Prin grads themselves. That wasn’t the case as I recall from my time there. I most enjoyed the faculty who had done “real world” work experience in the fields they taught, and always appreciated that perspective. I wonder how much of that there is there anymore. Stuart Jenkins, despite his terrible leadership style, had many valid points. Principia is a moribund institution that needs a good shaking-up. He just went about it the wrong way. You can achieve more if you make people want to follow you than you can by bludgeoning them over the head with the needed change. That said, will Prin change? It has to if it wants to survive. However, I don’t think it will simply because the needed change will destroy its raison d’etre: to serve Christian Science. Once the spotlight of critical examination is shed on Christian Science, it will wither and die. It simply does not stand up to any sort of critical analysis. That’s why Christian Scientists are so intolerant of it. If you are leaving, doubting, or questioning Christian Science, please know you are not alone! I am a secular-leaning former Christian Scientist. Kindism.org contains my (often critical) musings on Christian Science, religion, philosophy and occasionally parenting. If you are new to Christian Science, in Christian Science, curious about Christian Science, leaving or have left Christian Science, I highly recommend the "Resources" pages. Mary Baker Eddy is famously quoted for saying “The time for thinkers has come.” Which is great, unless you’re thinking critically about Christian Science. If you would like regular ex-Christian Science updates, we recommend The ExChristian Scientist at exChristianScience.com. .
February – it is February right? or use the contact form on the Who am I? page. Ads may occasionally appear at the bottom of some blog posts. They are WordPress-related. These ads do not imply any endorsement on the part of myself or any contributors to this blog. ©2015 Kindism. Unauthorized use and/or duplication of this material without express and written permission from this blog’s author and/or owner is strictly prohibited. Excerpts and links may be used, provided that full and clear credit is given to with appropriate and specific direction to the original content.